The waistband has been designed to fit at your waist, not on your hips. High waist jodhpurs with inbuilt core cupport. The extra-wide waistband prevents it from rolling down and cutting you in half. The front segment of the waistband sits at your belly button for core support. The rear segment sits at your waist supporting your lower back. The internal reinforced elastic "Core Support" waistband supports you all the way around. The lower leg has a sock finish adding comfort and even support around the calf muscle. 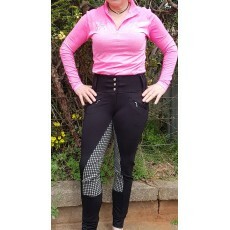 I just bought high waisted , core support breeches with silicone - love them. Very comfortable and flattering. No muffin top- or smaller muffin top!! I am in my 50s and I am a size 12 but I have a tummy, these are the most comfortable jods I have every worn. I asked for the belt loops to be removed, and I love them. I have recently purchased the high waisted silicone joddies. Very comfortable to wear and ride in... I loved the support for my waist and back. Can’t wait for these to be available in white for competitions!!! I purchased the high waisted silicone joddies recently.... fantastic joddies, so comfortable to wear and ride in, love the extra support around my waist and back! Can’t wait until these joddies are available in white for competitions!! Thank you Annette!